Hi. My name is Sarah. 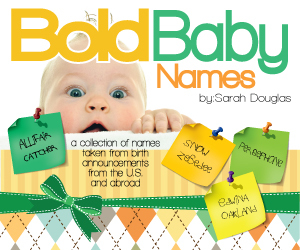 A baby name enthusiast who loves to peruse the New Arrivals section of newspapers and see what brilliant, unique, bizarre, wtf, & fabulous names that people name their baby and share them with others. If anyone wants to contact me for a request, baby name help, suggestions, my email address is names4real@hotmail.com. Do you visit other forums, like behindthename.com? I saw your link posted in Elisabeth’s blog. I’ll have to check out behindthename.com. Thanks for visiting. Yes, you can. I’m going to go check your site out. Hello I see my child’s name has been published here on your post of 27th October and I must say it concerns me. We did not publish our child’s name so I’m wondering how it made it on to your list. Kinda creeps me out. I enjoy your site a lot. It seems like you have a healthy sense of humor when it comes to names. Keep ’em coming! These names are great…not the typical baby name lists tucked between ads from mega-baby-product-stores. Now, what to name my child…. Thanks Jason. And good luck with choosing a name for your baby. Just discovered your For Real Baby Names blog and the post about Canadian Baby Names, which I really enjoyed. I’m a baby name enthusiast as well and run a business called http://www.babynamesresearch.com I have a blog on the site as well. Check it out and don’t hesitate to leave your comments. Best, & have fun reading all those birth announcements! You directed me to your blog from Nameberry. I think it’s fantastic! Just wondering, do you only select the names you find interesting or quirky on your blog? Or are these all the birth announcements from a particular paper? I was just wondering if you filter them in any way? I’m glad you like it! I hope you can find a name for your little girl. 🙂 I do filter just because there are too many to post them all. Every once in a while I post the first 30 I see or all the ones from a particular source. Here’s the link to the last one I did with no filtering from me. I love your blog! Recently I’ve become very interested in the names that real people actually choose for their babies, rather than the sometimes overly idealistic advice handed out on baby naming blogs. A great resource! Thanks! Love your blog’s name. I’m going to go check it out. Would you mind if I added your site to my blog roll? No, go right ahead. I’m going to add yours to mine. I saw my sons name on one of your list 11/12 /09. I was just curious if this was his name or someone else. Are the name taken for Birth announcements from that day? This is not his b-day. We are expecting you at http://www.allwomensites.com/ to subscribe your website. For any questions, feel free to contact us. Fun blog! Easy to get lost reading all the names. Some are quite amazing. I’ve got a few questions for you. When you list names in parentheses after the listed name, are those the sibling names? And when you list a place on the header, does that mean all the names are from that city or country? If you want, I’d love for you to add my name blog to your blogroll. It’s http://www.yournamestory.com. And I encourage anyone to click on the link to tell their name story! Welcome and thanks. Yes, names in parentheses are siblings. Yes to your other question as well. If I put a place, then that’s where I found them all. I think London is the only city I use because I get those particular birth announcements out of the London Telegraph and The London Times. I love the theme of your blog: real names! This is something I’ve been trying to figure out how to tap into. May I link to your blog from my site? Check mine out as well, if you’d like! Great work! I’ll check yours out too. Love this. Here I thought I was the only name junkie:) Question: Why do people just name their kiddos ANY old name (ie trendy names, weird names of things, etc etc.) when it’s So important to give them a good name? Just wondering. I love to meet another “Name Junkie”! 🙂 Welcome to the site. My daughters name is Stevie Marae Eunice-Rose. I see you have that name on your website. Just curious how you found her name and where you are from? I get all the names from birth announcements listed in newspapers and hospital nurseries. Thanks Kindra! I’m glad you like the site. I don’t think I get enough visitors to commercialize it, but thanks!